In early November, Orion was a proud sponsor of the Smart Hustle Business Conference, produced by entrepreneur, speaker and Smart Hustle Magazine producer, Ramon Ray. Following the conference, which was held in New York City, a VIP reception, including conference speakers, sponsors and other VIPs, was held at Orion headquarters. At the conference, the Orion team had the opportunity to speak to many of the hundreds of attendees of the conference in the exhibit hall shared with other sponsors, such as Salesforce. 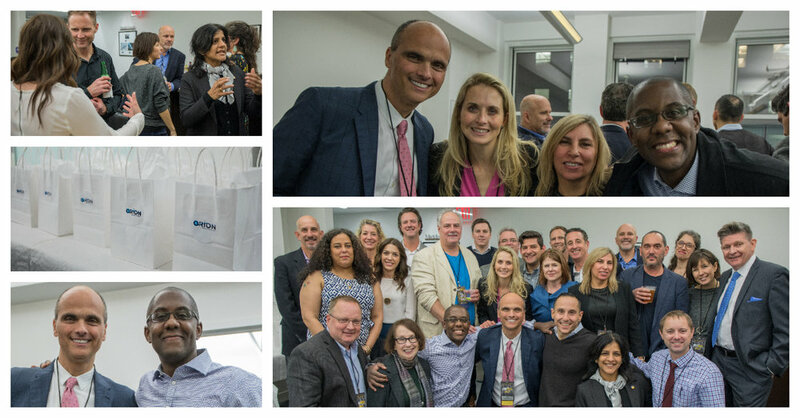 Throughout the day, Orion team members listened in on inspiring presentations by best-selling author Seth Godin, NYPD Transit Bureau Chief Joseph Fox, Salesforce Regional Managers Fariba Babaeizadeh and Jessica Medeiros, and other business leaders. At the VIP reception, which was attended by Smart Hustle presenters such as Strategist and TedX Speaker Lisa Hendrickson, Shark Tank Contestant and Co-Founder of Sole Mates, Becca Brown and many more, Ramon thanked Orion and introduced Yacov who gave a brief speech about the day’s success and the power of the entrepreneurial spirit before inviting attendees to introduce themselves and describe their businesses. Sign up for insights and expertise delivered to your inbox.